Rosalynn Bliss thanks supporters at a rally in Grand Rapids Tuesday night. Rosalynn Bliss will be Grand Rapids' new mayor. Bliss soundly defeated her opponents in today's primary, winning 66% of the vote and negating the need for a run-off election in November. Bliss has served as a city commissioner for the last decade. She'll be Grand Rapids' first female mayor. "I look at the numbers tonight and the votes, and I have to believe that people think women can be great leaders," Bliss said after declaring victory. "And I'm going to prove it." Bliss says her top priority will be strengthening the city's neighborhoods. Bliss's nearest rival for the seat was former school board president Robert Dean, who took 30% of the vote. John George and Willard Lee trailed far, far behind. Grand Rapids' longest-serving mayor, George Heartwell, couldn't run again because voters passed term limits last fall. 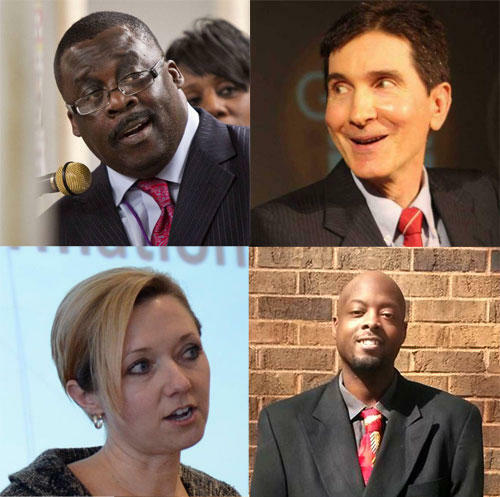 Grand Rapids voters will be electing their first new mayor in more than 10 years, and the primary is a week from tomorrow. Current Mayor George Heartwell is being term-limited out after serving in office for more than a decade.